This bright, clean and friendly Belgrave Hotel is just a few minutes’ walk from the “Oval”Cricket Ground and Tube Station. While many other hotels near Victoria Station, Waterloo Station, and hotels in Vauxhall expect you to pay a premium for Wi-Fi, we offer this service free because we want you to be comfortable, able to relax and enjoy your London break. At our hotel we also provide breakfast, tea, and coffee when you stay in our modern rooms. There is on-site parking. The tourist attractions surrounding Westminster and Buckingham Palace are just a few stops on the Tube away. Waterloo Train Station and the South Bank can be reached in 10 minutes’ Tube journey. Very close to Brixton Academy, the largest music venue in London. 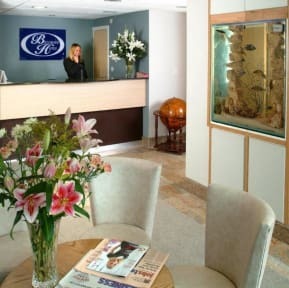 Modern rooms at the Belgrave Hotel each feature satellite TV, a telephone, radio and tea/coffee facilities. Each room has a private bathroom. While other hotels offer steep prices, we tend to offer value rates because we know you may be on a budget. All guest cards would be Pre-authorised 7 days prior to guest check in date. We will be serving continental breakfast inclusive in the room price. Breakfast from Monday to Friday would be served from 7.30 am to 9.30 am and Saturday/Sunday breakfast will be served from 7.30am to 10.00 am.